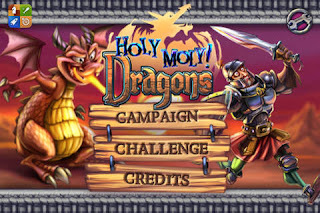 iTunes has the Holy Moly Dragons Game App for FREE for a limited time only! Please note that the price can change at anytime. DEFENSE! DEFENSE! DRAGON DEFENSE! Conquer the villains in the Valley of the Dragons. Strategically hatch unique powerful dragons in the paths of enemies who attempt to slay them and plunder their treasure. Gather food energy to morph your dragons with wings, horns, size, and power. Drop huge boulders on your attackers, shock them with lightning, or freeze them solid with your extraordinary abilities. HOLY MOLY DRAGONS! Features 17 levels, 3 challenge modes, 4 unique dragons, 3 powerful special abilities, leader boards, achievements, and more to come! iFanzine Verdict: A stellar entry in the iOS Real Time Strategy library, Holy Moly! Dragons is involving, exceedingly well polished and satisfyingly fleshed out.